Pine needle and citrus sorbet for a fancy night out, safe spots to smudge and radio shows with music to get your groove on. We have compiled a list of great things to see and do in Tkaronto and asked Indigenous staff and students across the university’s three campuses to weigh in with their recommendations. The first stop for Indigenous life, culture and a “home away from home” is First Nations House, located on the downtown Toronto campus but open to students from all three U of T campuses. FNH is the epicentre for Indigenous resources on campus. It's a great place to speak with Elders, meet new friends and access financial or academic support. Check out FNH's Twitter or Facebook for the many upcoming events this fall, including celebrations for its 25th anniversary. 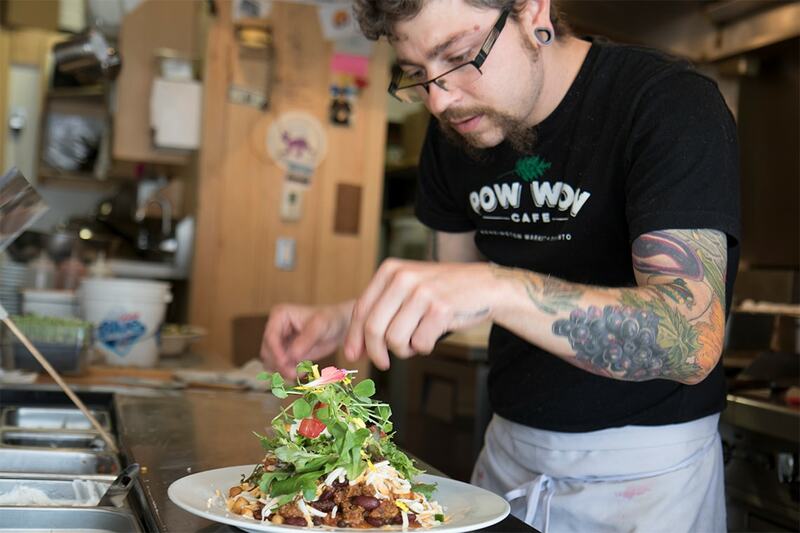 If you’re craving some comfort food, PowWow Cafe is located minutes from U of T’s downtown campus in eclectic Kensington Market. Sean Kinsella, co-ordinator of Residential Transition Programs at the University of Toronto Mississauga, says he likes this family-run eatery for its “really hip vibe”. The melt-in-your-mouth frybread is Chef Shawn Adler’s grandmother's recipe and forms the foundation of a sky-high taco piled with chili, cheese, sour cream, greens and a sprinkle of flower petals. In Toronto’s east end, Tea n Bannock is a favourite of Roy Strebel, Bear Clan leader of the Native Students’ Association. “They serve up awesome Navajo/Indian tacos, bison burgers and their corn soup is amazing,” says Strebel. Ku-kum's chef Joseph Shawana draws inspiration for his cuisine from foraging for “treats of nature” around his home community of Wikwemkoong, on Manitoulin Island. The menu is mouthwatering with offerings such as roasted elk, a fresh preserve plate with pickled cattail hearts, fiddleheads, milkweed pods and warm bannock, and a dessert of pine needle and citrus sorbet. “It’s a bit more money than the others, but completely worth it,” says Blackbird. Another popular spot is NishDish, located in Koreatown on Bloor Street, just west of U of T’s downtown campus. NishDish offers traditional Anishnawbe food and has quick counter service and catering. For quiet places to smudge, First Nations House and Turtle Lounge in the Centre for Indigenous Studies are great spots, says Julie Blair, Indigenous Education Network co-ordinator. Blair also recommends the IEN student lounge on the 7th floor of the Ontario Institute for Studies in Education, room 7-230. Strebel says smudging regularly happens in the Traditional Medicines garden on the east side of Hart House. He says the Native Students' Association – located on the fourth floor of First Nations House – offers the four sacred medicines or tobacco seeds to those who request them. The Native Canadian Centre – located just north of First Nations House on Spadina – sells medicines and other Indigenous gifts and crafts at its shop, The Cedar Basket. Kinsella also recommends the The Native Youth Sexual Health Network (NYSHN). For students looking for Traditional Teachings from one of U of T’s knowledge keepers, there is Elder in Residence Andrew Wesley at First Nations House and Traditional Teacher Lee Maracle. Maracle and Wesley are both members of U of T’s Elders Circle. Kinsella says at U of T Mississauga there are Elders Wendy Phillips and Cat Criger, who works at all three campuses. Blair notes that the Indigenous Education Network also offers visiting hours with Elders. Off campus, Blair says Dodem Kanonhsa offers group teachings and individual appointments with visiting Elders and Traditional Teachers from various communities. “It’s great to be able to learn from teachers from different places and Nations, as well as to be able to connect with teachers from my home community,” says Blair. Blackbird, who runs the Ciimaan/Kahuwe'ya/Qajaq (CKQ) – the Indigenous Language Initiative at the Centre for Indigenous Studies – says it posts events on the Centre for Indigenous Studies Facebook page. You can also follow CKQ on Twitter, where Blackbird tweets out Indigenous words, phrases and event information including drum socials and games nights. Blair says she enjoys learning about Toronto’s Indigenous history and meeting new friends by taking part in walking tours with First Story Toronto. Indigenous Education Week is scheduled for late October as part of First Nations House’s 25th anniversary celebrations. Toronto is absolutely exploding with Indigenous arts and entertainment. A good place to start on your artistic journey is by turning in to Indigenous Waves, co-hosted by Blackbird every Monday from 6 to 7 p.m. on U of T’s campus radio station, CIUT 89.5FM. The show plays a mix of traditional and modern music, along with local news and other information. Blackbird, whose drumming and singing can be heard at events and celebrations around U of T and beyond, recommends checking out ANDPVA, the Association for Native Development in the Performing and Visual Arts, which hosts the Red Revue and open mic sessions and the RPM website for news and other information. Artist and U of T alum Mike Ormsby and his team will build a traditional Anishinaabe birch bark canoe this month at the Evergreen Brick Works, part of the Toronto Arts Council’s Animating Historic Sites program. Visitors can watch the build for free, from Sept. 11-24. Native Women in the Arts hosts workshops, teachings and performances. “A lot of the performances are pay what you can, which is great for students on a budget,” says Blair. Annishinabe/Métis poet Gwen Benaway is another one to watch. For local musicians, Blair recommends checking out Ainsley Simpson, Leanne Betasamosake Simpson and Sadie Buck. For a good belly laugh, check out local Indigenous comedy with Manifest Destiny’s Child and Candy Palmater. Blair also shared her favourite Indigenous podcasts, Media Indigena, Henceforward, and Red Man Laughing.